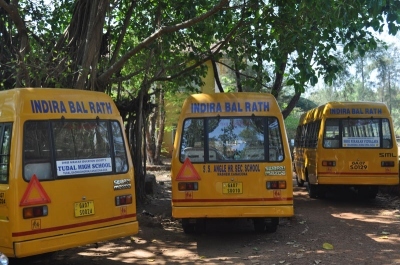 Panaji: Taking serious note of violations of transport rules and malpractices in the transportation of school children, the high court of Bombay at Goa issued detailed directions to ensure safety of school children. In a suo motu public interest litigation, a division bench of justices of F M Reis and K L Wadane, as an interim measure, laid down directions to be followed by authorities until draft rules framed by the transport department are effective. The high court felt that interim measures have to be implemented so that due process of law is followed when school children are transported to their respective schools. Since the transport department has facilitated SMS complaining, and a helpline has been put in place, on the suggestion of advocate general Atmaram Nadkarni, the high court directed that the helpline numbers be uploaded to the website. It further directed that punitive action be proposed against the violators under the proposed rules, in addition to the action under Sections 53, 54, 177, 207, etc. of the Motor Vehicles Act, 1988. To implement the directives and interim measures recommended by the high court, the transport department has been asked to ensure that necessary workforce be put in place. The high court also pointed out that in case there are any breaches by private or commercial motor vehicle owners, the authorities even consider taking punitive action, including cancellation of their registration, if any, in accordance with law. Advocate A D Bhobe who appeared as amicus curiae, among other measures for safety of school children, suggested that the owner or operator of the motor vehicle carrying, transporting school-going children to maintain a complete list of the school children indicating the names, school-class, residence and phone numbers of the guardian or parent of such students. He also suggested that the director of transport/director of education introduce a mobile messaging app or helpline, equipped to receive complaints from any person or member of the general public. He also said that that the app should have the option to upload a video or photograph. The transport department and traffic department were represented by advocate S R Rivankar. The high court will hear this PIL next on January 11, 2016.